Osamu Dazai. No Longer Human. Translated by Donald Keene. (1948; translation 1958, 1973, New York: New Directions). 177pp. ★★★★☆ (4/5). Recently I’ve been wrapping up my first novel, which will likely be called Rosebuds and Rye. It’s the first in a series of probably three parts, called No More Dreams, and I’ve started to pass it around. My friend Alice recently read a version which starts with the protagonist inhabiting a squalid apartment, failing at his PhD and despairing at having found himself on the outskirts of life, and she told me that my writing reminded her of Osamu Dazai. It’s been a long time since I encountered Dazai, through the translation of “Merry Christmas” that appears in The Oxford Book of Japanese Short Stories. All I can remember of it, now, is the image of the tuberculosis-afflicted protagonist coughing up bright red blood on the snow, and its prevailing attitude of despair. But I was nevertheless pleased (even as I might feel unworthy of it) to be likened to Dazai, for he’s regarded among the greatest Japanese writers of the twentieth century. Alice recommended that I read No Longer Human, regarded as the most autobiographical work of this writer who worked almost exclusively in the genre of the shishôsetsu or “I-novel,” which is often semi-autobiographical as a matter of course. This short work of just 177 pages takes the form of a diary or confessional memoir. It contains three notebooks penned by a man named Yozo, bookended by two explanatory notes from their discoverer and presenter, who is apparently a novelist or at the very least a writer of stories. Through the notebooks, we inhabit the perspective of a man who from the first considers himself outside the human race, unable to understand normal emotions or submit to normal mores. Yozo adopts a pretense he calls “clowning” in order to relate to people, and by this simulation of normal behavior, he endears himself excessively to others, especially women. Yozo is part reminiscent of Mersault from Camus’ L’Étranger (The Stranger/The Outsider). A man to whom nothing makes any difference, he therefore accuses himself of indifference when his wife Yoshiko is ‘violated’ (it is unclear whether she was raped or merely seduced) towards the novel’s end. And Yozo is also part pretender—his clowning reminds one also of the TV antihero Dexter, an avenging psychopathic serial-killer who goes through the motions of relationships with friends and family as a disguise, and in doing so transforms into something more like a normal, empathic human being. Dexter’s is a case of “fake it ’til you make it,” and he is a caricature in a parable about how we end up living up to our own deceptions—a positive process, if we pretend to be something higher than we are. (The observation holds up somewhat less well for the original Dexter of Jeff Lindsay’s novels, who is more consistently and incorrigibly inhuman.) Mersault, too, is flatter-than-life, an illustration of the modern inability to find stable ground for our conceptions of meaning in life now that we have recognized the absurdity of religion. Yet Dazai’s alter-ego Yozo is more the genuine article. For Yozo does not seem to be the pretender he imagines himself to be: we find him, in fact, an excessively sensitive person who is tortured by self-doubt and by the untrustworthiness, selfishness, and cruelty of others. Yozo is the real deal. He only imagines that he is a fake. Dazai, much like the later Kenzaburô Ôe, Nobel Prize winner and practitioner of the shishôsetsu, was devoted to portraying life with all its disappointments and grotesquerie, and to writing semi-autobiography that catalogs, with almost excruciating acuity, its author’s frailties. And the author himself, if we take his literary talents out of the equation, was nothing if not frail, albeit in a way that spoke of a manic appetite for life. Eventually a sufferer of tuberculosis (like the protagonists of “Merry Christmas” and No Longer Human both, and the kindred author Albert Camus), as a young man he was dissolute, indulging in alcohol and prostitutes, and attempted suicide repeatedly until finally succeeding in a pact with his mistress Yamazaki Tomie in 1948. The value of these tales (Dazai’s, Camus’, Dexter’s), are in letting us know that we are not alone in finding life meaningless, or in believing ourselves frauds. Seeing Yozo torture himself with the self-fulfilling prophecy that he is unentitled to love, happiness, or grace, one may feel consoled in one’s own sense of unworthiness, and cautioned not to deny ourselves affection out of a sense of having sinned. In another parallel to L’Étranger, No Longer Human is a very short book to be today called a novel. L’Étranger, in fact, is short enough to be tarred with the ignoble name novella. While, pushing up to 200 pages, No Longer Human is safe from that, it would still fall afoul of that assumption that “no publisher today will look at a novel manuscript of less than 60,000 words,” and perhaps neither of those books, as novels, would receive much public attention if left to languish within the world of print publishing, which has developed this hostility to the short, and mercifully digestible novel. No Longer Human also transgresses against the lamentable “show, don’t tell” dogma that is the staple of creative writing courses throughout the English-speaking world. But that’s another discussion. Fortunately, there are new opportunities for short work in the realm of ebooks, where prices and turnaround times are lower. This is a time-poor world, and there must be some connection between the decline of reading and the fact that novels are now so long. Ebooks can put easily-digestible work in a person’s satchel, handbag, or pocket (on an iPhone, on a Kindle, on an iPad), and shorter novels are perfect for the indie author who must publish often and quickly to garner attention and income. No Longer Human belongs in today’s literary milieu. 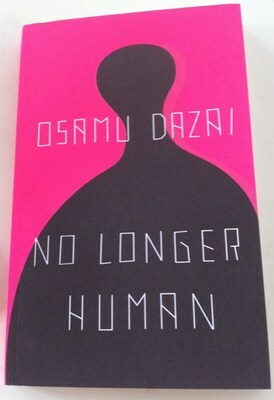 It is a shame, then, that No Longer Human is not available as an ebook, as, indeed, is so much Japanese fiction. One cannot, for instance, read Ôe, nor Yoshikawa Eiji (Musashi), not Endô Shusaku and not even Mishima Yukio. The only Japanese author I’ve identified, in fact, who can with any reliability be had in ebook form is the relentlessly popular Murakami Haruki (and let us give our thanks for that). It’s an endless puzzlement to me how many great writers are completely absent from the ebook medium. Go look for Graham Greene or Milan Kundera—in fact, go look for The Outsider—but the almost total exclusion of Japanese writing is astonishing. I’m not sure what the reason for this is: have Kodansha and Tuttle stayed out because they don’t have the US bank accounts that Amazon and Barnes and Noble require? Is it too difficult to get ebook rights at favorable terms from the estates of Dazai et al.? We may hope that time will rectify the omission, saving these works from the oblivion they will otherwise face as we inevitably abandon print altogether. It is, after all, irrational to print and ship books when, digitized, they can be transmitted across the world instantaneously at close to zero cost.